Who is the team behind Walkable Princeton? The team behind Walkable Princeton is made up of Princeton and Princeton area residents who believe in a smarter, more sustainable approach to development and the built environment in the Princeton region. We are an independent group, unaffiliated with any developer, political party or union. We have no income or paid members of staff; everyone who contributes does so on a voluntary basis. If you want to connect with the team, please send us a message at walkableprinceton@gmail.com, or use our ‘contact form‘ (we always try to get back to people the same day) or come to one of our regular meet-ups, which we advertise via the blog, our Facebook page, and Twitter. What is the motivation for Walkable Princeton? Walkable Princeton was founded to raise awareness of issues relating to zoning and the built environment in Princeton. We advocate a positive vision for Princeton’s future, taking full advantage of Smart Growth principles adapted to the local area, with the goal of reducing traffic, enhancing the tax base, preserving open space, reducing water runoff, encouraging sustainable living and enhancing a vibrant Princeton downtown. Our logo incorporates two iconic buildings that demonstrate the best features of traditional, mixed-use development in Princeton. The logo shows (left) the First National Bank Building, built in 1903, and (right) Lower Pyne, built in 1896. 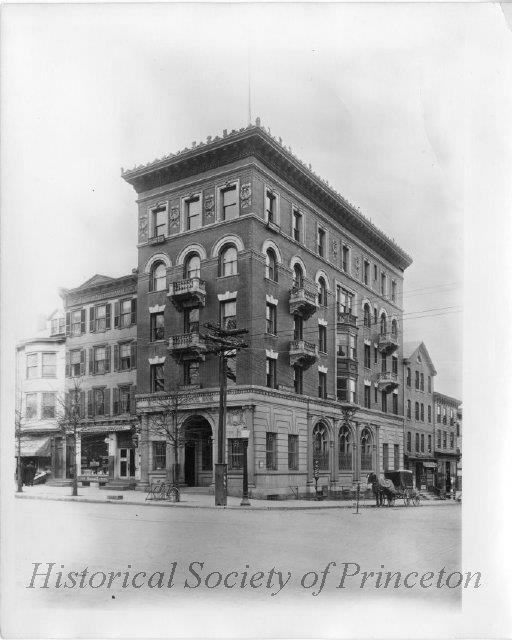 Both of these buildings stand at the junction of Witherspoon Street and Nassau Street, opposite Princeton University’s famed Nassau Hall, and in the heart of downtown Princeton, NJ. Both the First National Bank Building and Lower Pyne were built to allow a mixture of uses, with commercial activity on the lower levels and residential apartments above. This kind of compact, mixed-use development makes efficient use of land, enabling people to live near where they work, shop and play, and makes walking and cycling the easiest way to get around. Historic Lower Pyne, Nassau Street, Princeton, NJ. 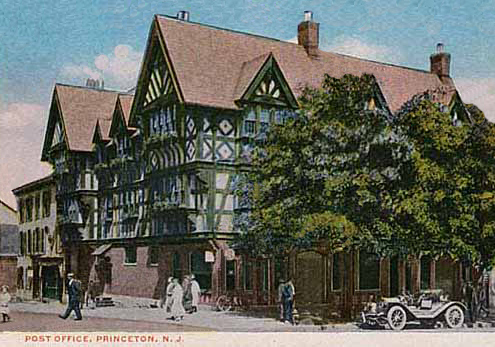 These historic buildings demonstrate that mid-rise buildings are part of our architectural heritage and can beautify and enhance Princeton in the future too. By embracing a moderate level of density around our downtown, we return to the best of Princeton’s historic layout and enable a vibrant downtown without our present overwhelming dependency on cars and traffic. Who makes up the Walkable Princeton Community? Walkable Princeton is open to everyone as a forum for discussion and sharing of ideas. We are wholly inclusive and do not discriminate against anyone regardless of opinion, origin, politics or personal background. As a growing community, Walkable Princeton has been ‘liked’ by more than 1,000 people on our Facebook page. Our Facebook community is a diverse group, the majority of whom are Princeton residents, and almost all of whom live in the Princeton region. Thanks for liking my “Hoagie Haven” post!